The machines will be used to supplement XPO’s existing workforce and support future growth, according to a statement released by the company on Oct. 3. XPO will partner with Singapore-based robotics manufacturer GreyOrange Pte. 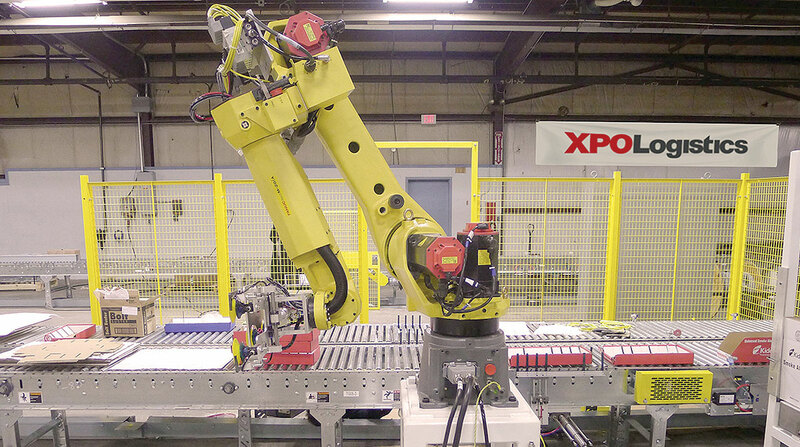 Ltd. to deploy the material-handling robots and will act as the exclusive logistics provider for use of the robots in regions where XPO operates. Jacobs said the autonomous robots are part of a planned $450 million investment by XPO Logistics in technology this year. Each robot is capable of moving a storage rack that weighs as much as 3,500 pounds and bringing it to a work station where a worker fulfills up to 48 orders simultaneously. Founded in 2011, GreyOrange recently established its U.S. headquarters in Atlanta and opened a research and development office in Boston. In August, the company also hired Chris Barber, a former head of southern operations for Honeywell Intelligrated, to serve as regional CEO of North America. The company said it will begin manufacturing robots in the U.S. in 2019. “I see a massive opportunity in the U.S. to make robots widespread in the workplace,” Barber said following his appointment. Last month, GreyOrange raised $140 million in venture capital to fund further development of industrial automation systems. In addition to the U.S., GreyOrange has offices in Asia, India, Japan and Germany. XPO Logistics, based in Greenwich, Conn., ranks No. 1 on the Transport Topics Top 50 list of largest logistics companies in North America.